A solar eclipse over southern Australia gave a local expert a chance to tell visitors about the country's ancient star legends. Many people are at least vaguely familiar with the constellations, such as Orion, Scorpio and Gemini. But how many people have heard of emus, kangaroos and sharks in the night sky? 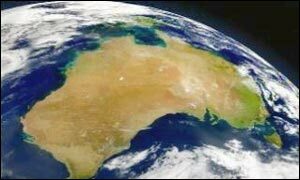 Australian astronomy expert Paul Curnow is attempting to educate people about how Australian Aborigines have viewed the sky for at least 40,000 years. Many of the tales outdate the Babylonian, Egyptian and Greek constellations which have become so well known. Mr Curnow, who lives in the South Australian capital, Adelaide, teaches people "Australian starlore" in a seminar at the city's planetarium. But he had a rare chance to spread the word further last month. Thousands of people from around world visited the state for the total solar eclipse on 4 December. Mr Curnow was among the experts who hosted tourists for the event, and he used the opportunity to lecture people from the UK and the United States about his passion for Aboriginal constellations. "I had a strong focus on teaching them some indigenous astronomy," he said. "Aboriginal people have been viewing the night sky for tens of thousands of years and indigenous Australians are regarded as our world's earliest primitive astronomers. "They have been using their constellations to re-enforce tribal law, to educate and, in general, to use the night sky as a giant storyboard. "The sad thing is because these stories are passed down orally from elder to learner, many of them have been lost to antiquity." Australia's climate and dark skies make for perfect stargazing, and it is for this reason Aborigines formed unique views of the shapes above. For example, some legends involved shapes formed not by the stars but by the dark corridors between stars. One such constellation is a giant "celestial emu" which spread across much of the sky. The position of the stars was also used for practical purposes, Mr Curnow said. "Their constellations were used pragmatically in that depending on what stars were in the sky, they would know what food resources were available. "The constellations told them what type of weather was ahead, what plants were in season and when certain animals were breeding. "They closely identified what was happening on the ground and related that to what they could see in the sky." The large and small Magellanic Clouds are two neighbouring galaxies visible from the Southern Hemisphere. The Kaurna tribe of the Adelaide plains believed they were the ashy remains of two parakeets which had been trapped, roasted and eaten. The Pleiades star cluster was known to some Aborigines as a group of women called "Makara". Ground frost was explained as icicles dropped by these women as they moved across the sky. Australia's best-known constellation is the Southern Cross, or crux, and it appears on the national flag. As Mr Curnow's sketch shows, the Ngarrindjeri tribe saw a sting ray and the so-called "pointer stars" were two sharks in pursuit.